The ingenuity/insanity of some people never fails to amaze me. 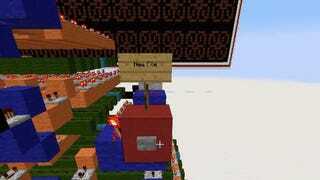 The scale of the workings used to make this 5x10 character display, using only redstone, is dauntingly huge. 5x10, 50 character limit monitor using 16 segment display. There are 7.357x10^92 different combinations the screen can show, all of which can be controlled from 1 line.